When you start with Kickserv your first impression with your customers in important. When you begin to create your first opportunities and invoices the numbers are going to be very low. Sometimes you don't want to broadcast that you are on a new system. How to create your first invoice with a higher invoice number? We make this very simple for our customers. on the right hand side towards the top of the screen notice [Edit Job] and the arrow for the dropdown. 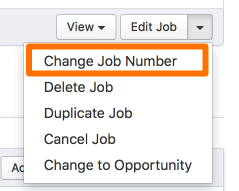 choose the dropdown and click "Change Job Number"
type in your new invoice number and then [Update Job Number]. Job numbers are created in sequential order. The limit is 5.4billion (that 5.4 and eight zeros).